Ed Sheeran is back to the world of social media after a 1-year long hiatus. He was mysteriously seen on his social media site on December 13, 2016. The British singer last year in December had made an announcement to his fans and other contacts that he wanted to take a break from being social, and for that reason, he would be away from his mobile phone, email and everything on social media till the next year so that as he could travel, enjoy his off-time and fully concentrate on his next album. Ed’s simultaneously appearance on Twitter, Facebook as well as Instagram exactly after 12 months was a kind of surprise to those waiting for the red-hair singer to be in touch with them through social media. Ed gave his all of his photos a light blue shade for three of his social media profiles. Moreover, his image on Facebook cover was also prominent with a light blue shade. He also posted a large blue colored square on Instagram and Twitter. The singer didn't provide the readers any kind of explanations for what he was uploading on his social media sites. 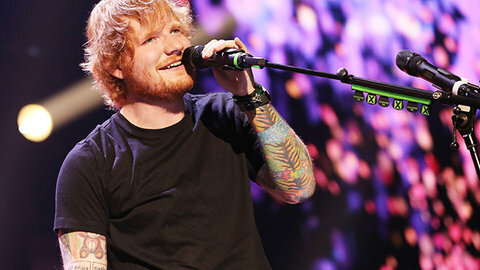 However, the changes from Ed's side have prompted his followers to believe he is now really back to gear up for releasing the new album which will be an amazing follow up to "X", his second album that was released in 2014. On the other hand, Amy Wadge who has been with Ed as his frequent collaborator in an interview had told the host of Newsbeat BBC that their record is almost completed and Ed Sheeran would give an entry to the Internet when it is really coming out really soon. Ed also explained why he was away from the local media for such a long period of one year. He said he has had such an incredible ride in last 5 years but he finds himself seeing the world via a screen instead of his eyes, therefore he was taking the opportunity of him not having to be anywhere or do anything for traveling around the world and seeing whatever he had missed by that time. Thanking his fans for their continues support, Ed said he is really thankful to his fans as they have been so wonderful to him. He revealed the upcoming album will be his third album and he thinks this is the best thing he has prepared this far. The 25-year-old remains out of the limelight since last year as the largest part of his life but his return was lately marked with a live performance back in November this year which was scheduled for a charity show held in London. Following the performance, he told the audience that it was really nice to come back. He has had a whole year off. During his vacations, Ed also went to Japan and spent almost a month there. He said he really enjoyed hanging out with Japanese people."